Help Center2. Help2.2 GlossaryWhat is a CSV file? A CSV file format, also known as a Comma Seperated Value format, contains plain text seperated by comms. Each line of the file is a record and every record contains a field that is seperated by a comma. CSVs are one of the most common data exchange formats that are widely supported by consumers and businesses. That’s why the CSV format is one of the most popular file formats in the Spotzi Datashop. A CSV file format can be used to exchange geospatial data. That’s the reason that a CSV file format can be imported into all kinds of (GIS) data software like Mapinfo Professional, ArcGIS, QGIS, Tableau Software, Microsoft Power BI, Google Maps, Mapbox, Carto and the Spotzi Mapbuilder. What software opens a CSV? Import a CSV with addresses to plot on the map? 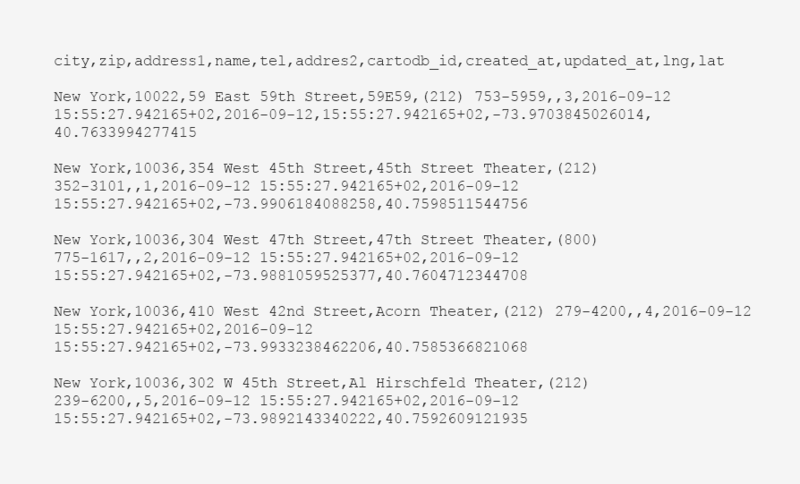 Did you know that Spotzi also has geocoder you can use to plot addresses in a CSV/Excel file on a map. Read our documentation on how to import a CSV with addresses. A CSV with a geometry (polygons and lines). This type of file contains a geometry column (the_geom, the_geom_webmercator) with large lines of text.